The IPCC just released its report Global Warming of 1.5°C. 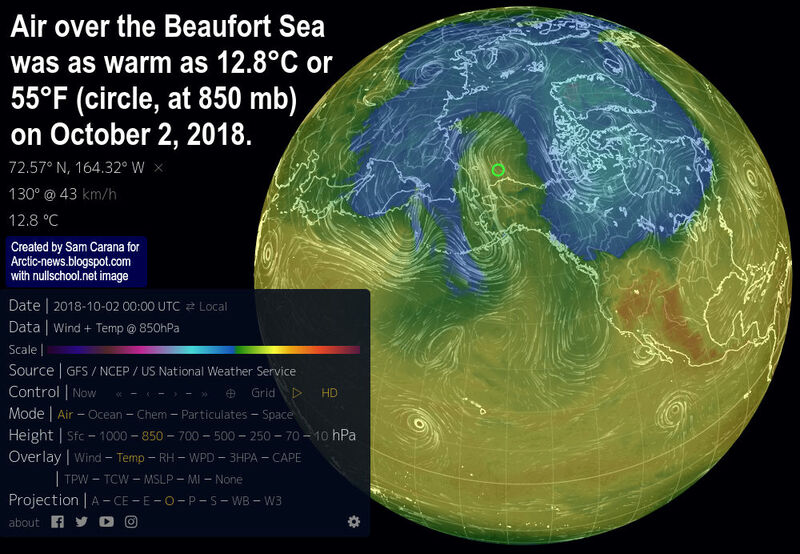 Things aren't looking good and instead of providing good advice and guidance, the IPCC bends over backward in efforts to keep feeding the addiction. The Paris Agreement constitutes a joint commitment by all nations of the world to keep the temperature rise below 1.5°C. 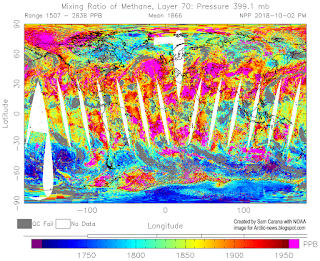 The IPCC should have honored this commitment by explaining that the situation is dire and by pointing at action to be taken to improve the situation. 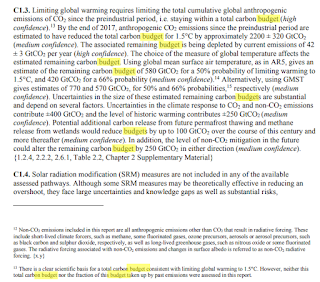 Instead, the IPCC bends over backward to make it look as if temperatures were lower than they really are, in an effort to make it look as if there were carbon budgets to be divided, and polluters should be allowed to keep polluting until those budgets had run out. This is like saying that drug junkies who cause damage and are deeply in debt, should be handed over more OPM (other people's money, in this case the future of all people and other species). In reality, there is no carbon budget to be divided, there is just a huge carbon debt to be repaid. The urgency and imperative to act is such that progress in one area cannot make up for delays elsewhere. The best policies should be implemented immediately, and everywhere across the world. Use of terms such as trade-offs, net-outcomes, off-sets, carbon budgets and negative emissions is misguided and highly misleading. Policies based on giving and trading in permits to pollute are less effective than local feebates, i.e. polices that impose fees on sales of polluting products and then use the revenues to support rebates on the better alternatives sold locally. While the Paris Agreement is clear that pre-industrial is to be used as baseline, the IPCC has instead chosen to use 1850-1900, a period when the Industrial Revolution had long started. This compromises the entire Paris Agreement and thus the integrity of us all. Temperatures may well have been 0.3°C higher in 1900 than in 1750, as depicted in above image in the light blue block. Add up the warming elements and it may well be that people have caused more than 2°C of warming already and that we're facing warming of more than 10°C by 2026. 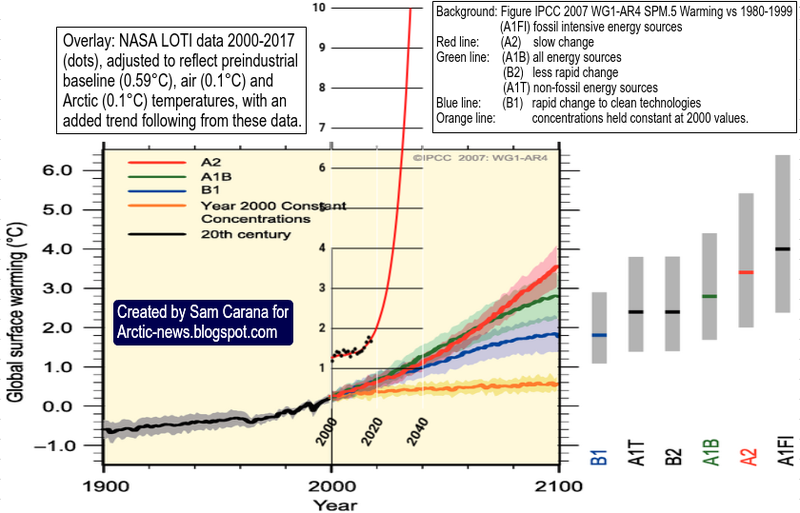 The IPCC suggests that warming caused by people is 1.0°C (±0.2°C), likely to reach 1.5°C between 2030 and 2052. 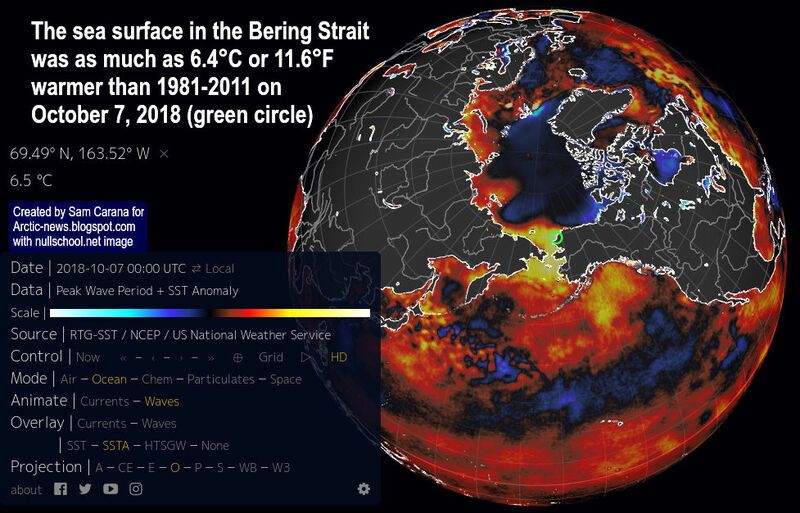 To reach these numbers, the IPCC used misleading calculations in efforts to downplay how dangerous the situation is, as discussed further below. 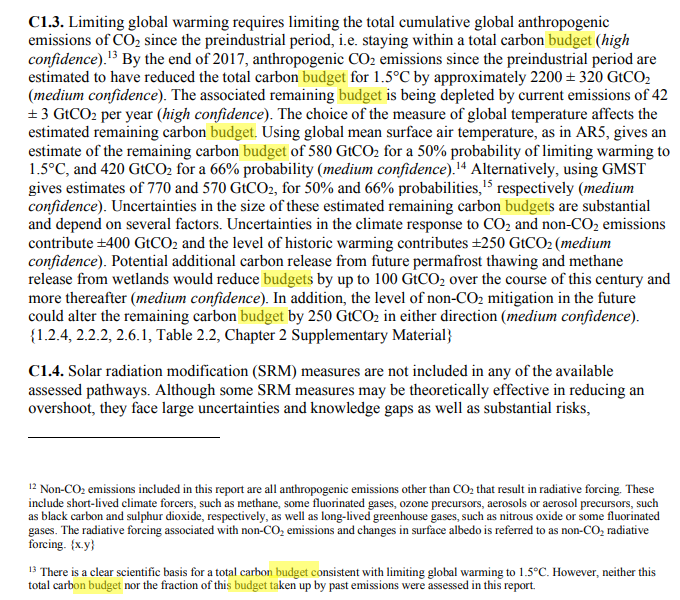 As an example of misleading wording, the IPCC says it has high confidence that 1.5°C won't be reached until 2030 if warming continues to increase at the current rate of 0.2°C per decade. Sure, if warming was 1.0°C and if it was indeed warming at 0.2°C per decade and if that warming would continue at 0.2°C per decade, yes, then it would take 25 years for warming to reach 1.5°C. 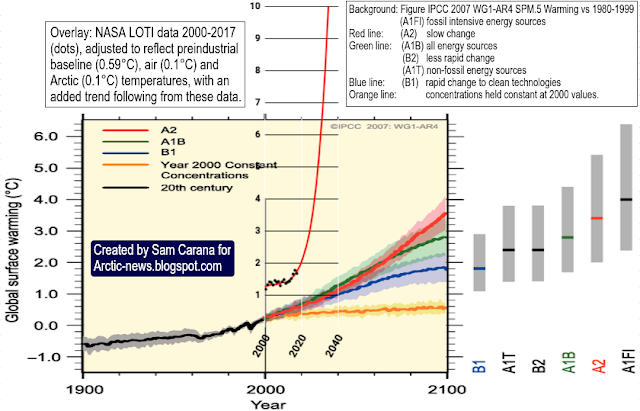 But the reality is that warming is already far more than 1.0°C and that it is accelerating. That makes it misleading to associate high confidence with the suggestion that warming will not reach 1.5°C until 2030. 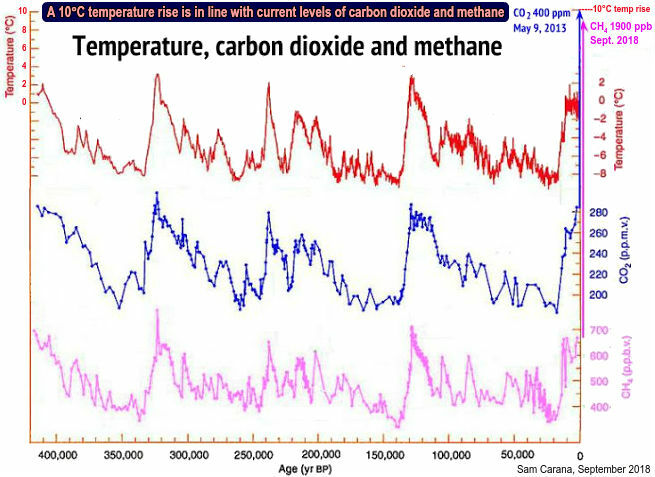 The use of a straight line (linear trend) is misleading in the first place, since warming is accelerating. The use of a straight line is even more misleading when such a straight line is then used to make projections into the future and qualifications such as high confidence are added. Daily and monthly peaks are obviously higher than annual averages, and it's those high peaks that kill, making it disrespectful toward past and future victims of extreme weather events to average that away. NASA records show that, in February 2016, it was on average 1.67°C warmer than in 1900 (i.e. 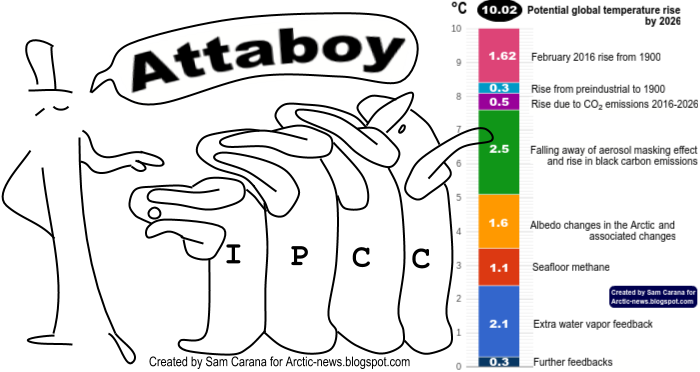 a 30-year period centered around 1900), while the higher latitudes North had anomalies up to 10.8°C. On land, the average anomaly in February 2016 was 2.26°C. 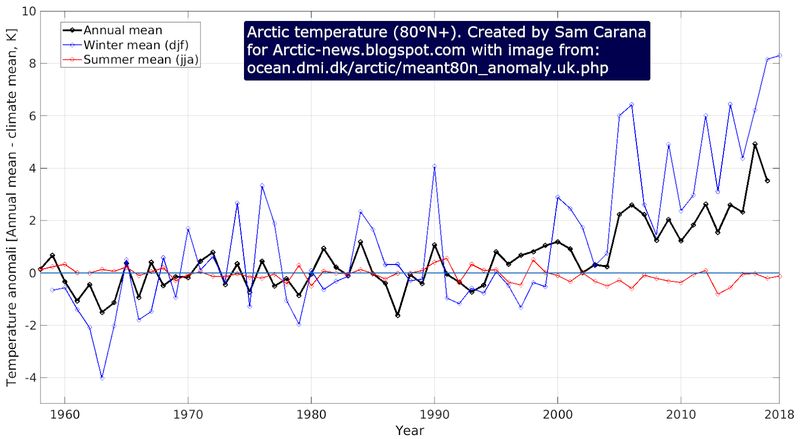 And this is before adding 0.3°C for the rise before 1900, and before further adjustments as discussed below. Conservatively, the magenta block at the top of above image shows a rise of 1.63°C. For a baseline of a 30-year period around the year 1900, the temperature rise to 2016/2017 was 1.22°C, NASA records show. When adding another 0.3°C rise for the rise before 1900, warming was well above 1.5°C in 2016/2017. 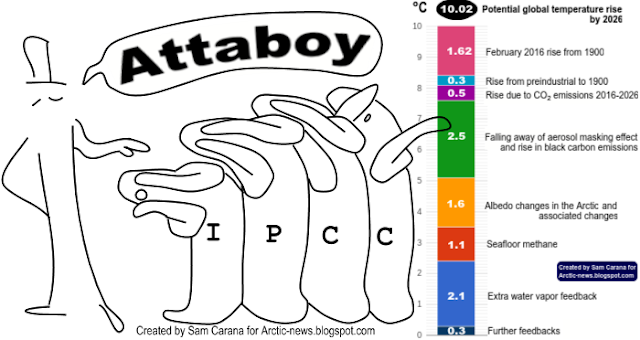 However, the IPCC conveniently selects an 1850-1900 baseline, a period when it was relatively warm, i.e. warmer than in 1750 and warmer also than in 1900. It was warmer from 1850 to 1900 due to increasing livestock numbers and forests clearing, while huge amounts of wood were burned, all contributing to large emissions of black carbon, brown carbon, methane, CO, etc., which caused additional warming during this period. So, this period was relatively warm. There was little impact yet of the sulfur aerosols that started coming with burning fossil fuel from 1900. Choosing this baseline period enabled the IPCC to beef up the temperature for the baseline and then draw a linear trend from 1850-1900 that looks flatter. The U.K. Met Office's HadCRUT dataset goes back to 1850. The IPCC used this dataset, but actually changed the data, by averaging the data with datasets that showed a similar rise for the years after 1900, but that showed higher warming for 1880-1900. This enabled the IPCC to further beef up the average temperature for the period 1850-1900 and then draw a linear trend from 1850-1900 that looks even flatter. To further support its suggestions, the IPCC uses water surface data for ocean temperature, but uses air data for temperatures over land. When selecting datasets with more consistency and using air temperatures globally, the temperature rise is 0.1°C higher. The IPCC chooses not to use new techniques to estimate temperatures where data are missing. 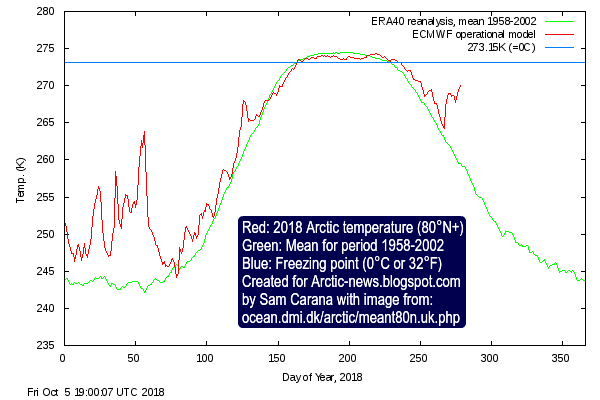 Less data are available for the Arctic, and this is precisely where temperatures have risen much faster than in the rest of the world. 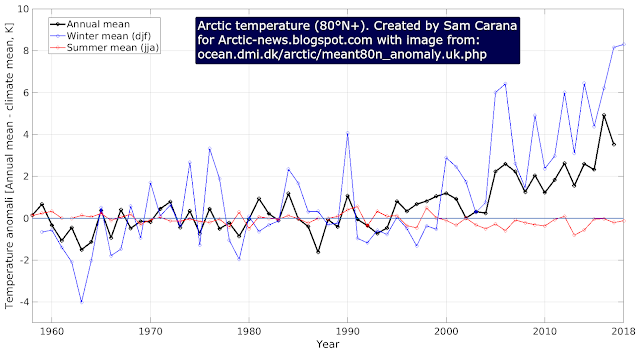 When values for missing data are included, the temperature rise is another 0.1°C higher. The IPCC suggests there was a temperature rise of 0.2°C per decade in the years up to 2015, as if the high temperatures in 2016 didn't occur. The IPCC then uses that 0.2°C rise to make projections into the future, conveniently skipping the high temperatures in 2016. 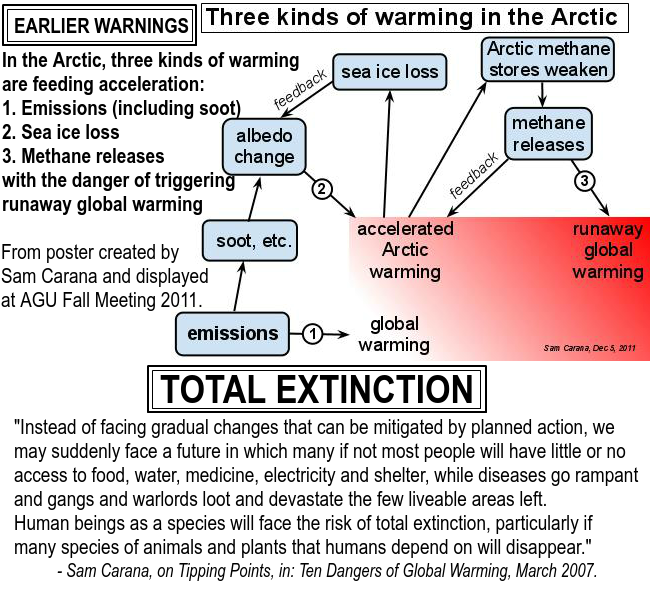 Failure to properly address acceleration of future warming is further discussed in the point below. The IPCC fails to point out that carbon dioxide reaches a maximum in warming the atmosphere some 10 years after emission, which means that the full wrath of global warming due to the very high emissions of carbon dioxide over the past decade is yet to come. 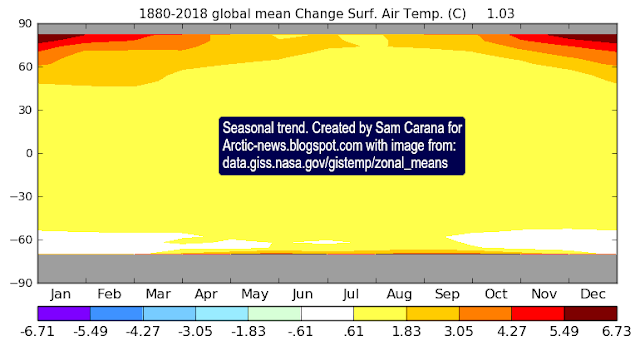 While temperatures could rise very rapidly over the coming decade, the IPCC keeps talking about carbon budgets, without properly addressing tipping points such as the decline of the snow and ice cover that will result in huge albedo losses, jet stream changes, more and more extreme weather events, and more. 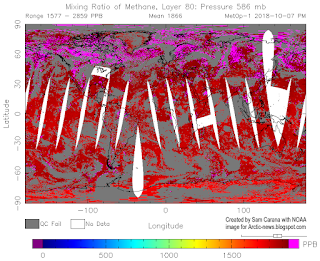 The IPCC fails to point out the danger of destabilization of sediments containing methane in the form of hydrates and free gas. Furthermore, the IPCC fails to properly address the aerosol warming that will occur as sulfur emissions decrease and other aerosols increase such as black carbon, brown carbon, etc. 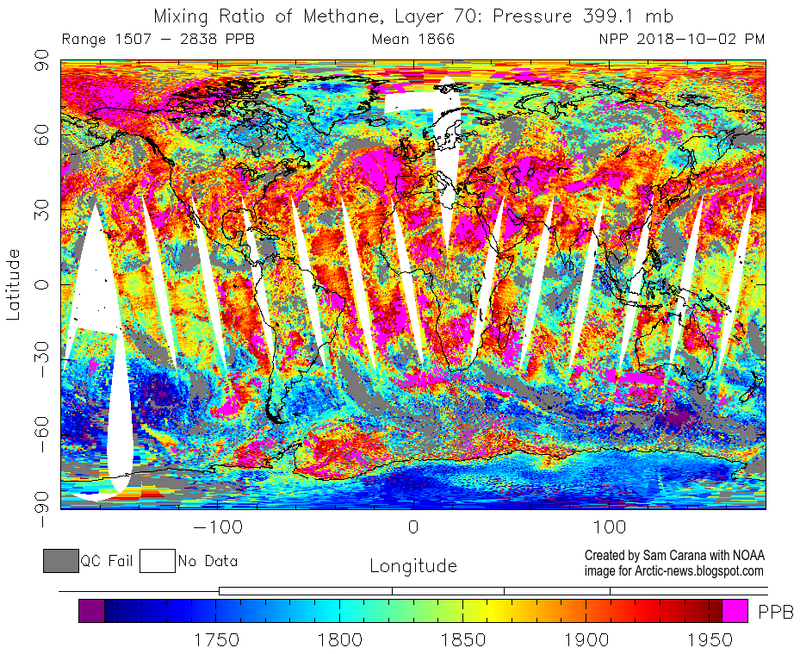 The IPCC fails to mention the water vapor feedback, i.e. the increase of water vapor in the atmosphere that will occur as a result of these developments. Since water vapor itself is a potent greenhouse gas, this will speed up the temperature rise even further. These developments could lead to a potential global temperature rise (from 1750) of more than 10°C by 2026, as illustrated in the image at the top. 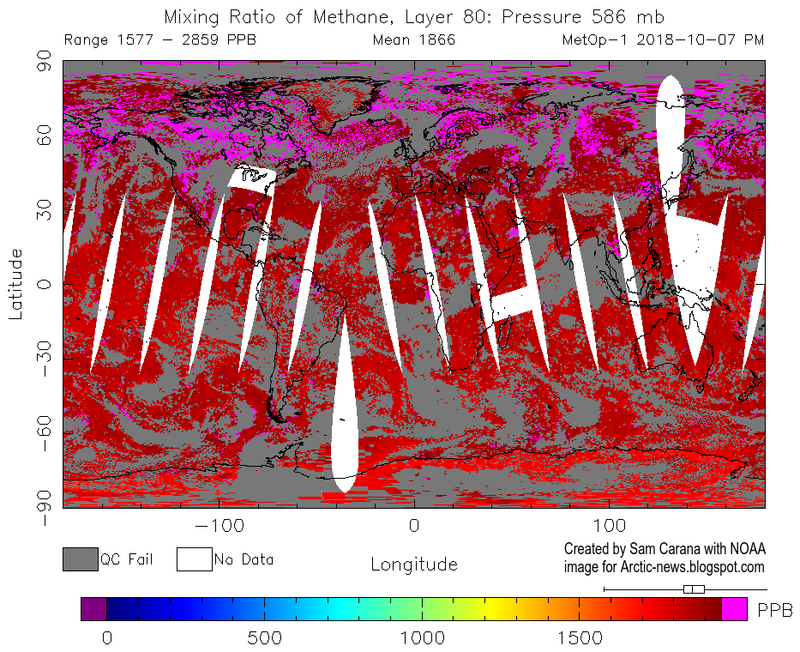 Instead of pointing at the dangers, as it should have done, the IPCC makes it look as if there was a remaining carbon budget that should be divided among polluters, as if they should continue polluting the world. It should be obvious that there is no such budget. Instead, there's only a huge and very dangerous carbon debt. There is no room for trade-offs or offsets, and terms such as negative emissions are also inappropriate. All efforts should be made to cut emissions, including ending current subsidies for fossil fuel and livestock, while at the same time great effort should be taken to remove carbon from the atmosphere and oceans. And even then, it's questionable whether any humans will be able to survive the coming decade, which will be critically dangerous for all species on Earth. The pathways suggested by the IPCC keep fossil fuel in the picture for many years, while highlighting non-solutions such as BECCS. The IPCC makes it look as if coal-fired power plants could continue to operate, by burning more biomass and capturing carbon. The IPCC makes it look as if transport could continue to use internal combustion engines, by burning more biofuel. Instead, clean & renewable energy has many benefits, including that it's more economic, so air capture powered by such facilities would make more sense than BECCS. Furthermore, electric vehicles should be supported now, rather than in the year 2050. It makes sense to stop fossil fuel subsidies, and to support better diets, to plant more vegetation and to support ways to add carbon and nutrients to soils and oceans, such as with biochar and ground rocks. Many technologies have been proposed, e.g. refrigerators and freezers are now made that do not use gases for cooling. The IPCC should not have used pathways that are wrong in the first place. Instead, the IPCC should have pointed at the policies that can best facilitate the necessary transitions, because the scientific evidence is overwhelming and it's the right thing to do. The IPCC report fails to point out that imposing fees on polluting products is the most effective policy instrument, the more so when the revenues are used to support rebates on better alternatives supplied locally. Proper analysis would have pointed at what the best action is to improve the situation. However, the IPCC does not do that. 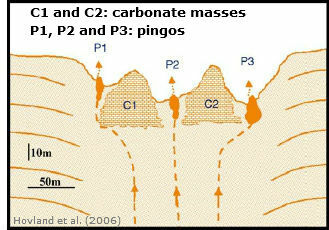 Instead, the IPCC keeps stating that there was a carbon budget to be divided and consumed, while advocating non-solutions such as BECCS and while hiding the full extent of how threatening the situation is. 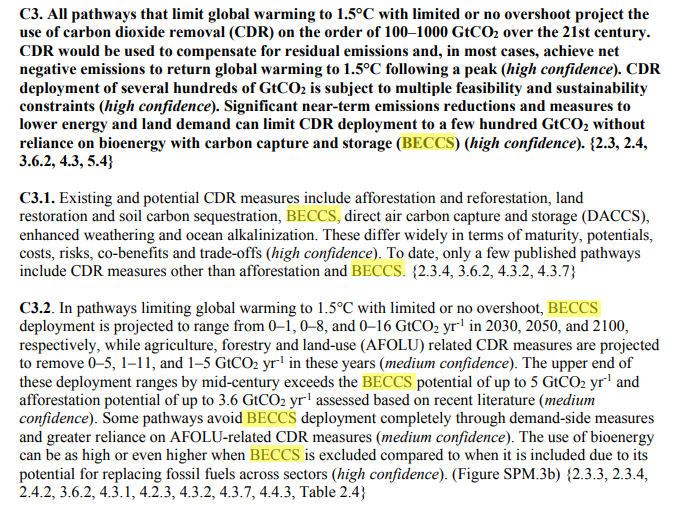 A quick word count of the IPCC report Global Warming of 1.5°C (SPM) shows paragraphs full of words such as budget (1st image right) and of non-solutions such as BECCS (2nd image right). At the same time, it fails to mention biochar, meat or local feebates. 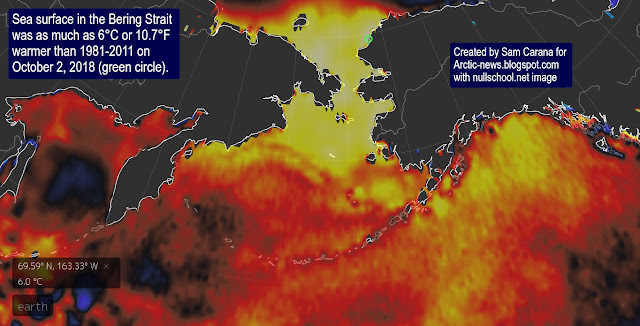 It fails to mention the huge threat of feedbacks and tipping points such as methane hydrates and Arctic sea ice, instead making it look as if all that could only pose potential problems over longer timescales. This is indicative of how much the IPCC is part of the problem and part and parcel of the wilful destruction of life itself that is taking place so obviously all around us. 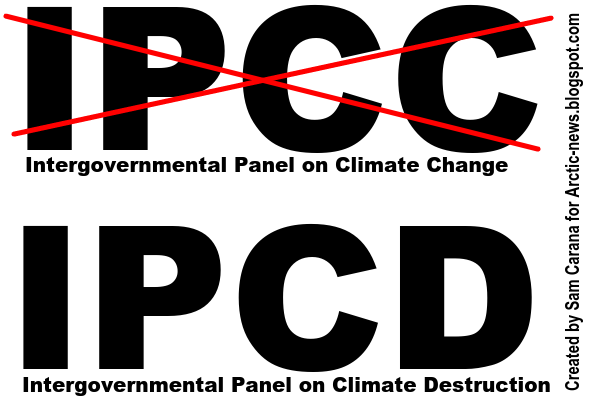 The IPCC (Intergovernmental Panel on Climate Change) might as well change its name to IPCD (Intergovernmental Panel on Climate Destruction). It's not as if people weren't warned.